Today was the second private coaching event that we have organised for London Dynamo. The weather on the way to the circuit did not bode well, and looked as though a damp miserable day lay ahead. Things had brightened up after the welcome tea was served and introductions and the session format was delivered. 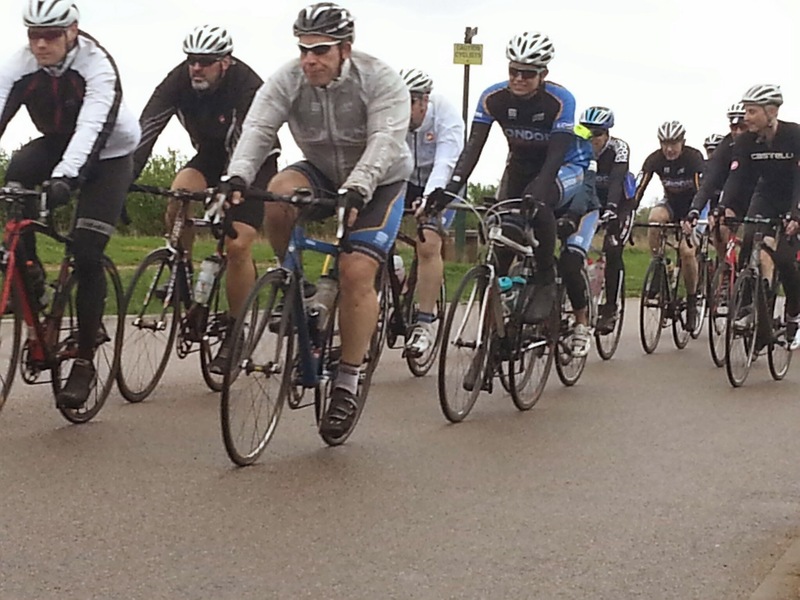 One of benefits of Hillingdon Cycle Circuit is that once the rain does stop, the circuit starts to dry quite quickly. We moved outside to get the session going. With 21 riders from London Dynamo, and our three riding Coaches from Prime, we split the group into two halves. Each group took to a 20 minute warm up, executing through-and-off from both left to right and right to left. After warm up, we broke the group down into 3 groups. The focus of the next exercise was bridging gaps. We set the groups off at intervals, and asked the first two from each group to bridge the gap to the next group. When the gap was bridged, the next two riders went off, and so on. Most riders were expected to bridge a gap of around 1/3 of a mile, although for some the gap was much longer. After this exercise, it was time to let heart rates settle a little. The aim of the next exercise was to introduce riders to make there way down the center of two lines of riders. As well as building confidence within a group, this exercise expects the rider to focus on making themselves bigger, and starting to command their position through the group. The next exercise was to simulate an attack and to cover it once it was made. Four of the stronger riders were instructed to make a tactical attack somewhere on the circuit. The subsequent chasing group were then to pick up the pace, not letting the attackers get away further than 100m. This worked perfectly from a coaching perspective – a couple of riders attempted to bridge too hard and unaided, which quickly saw them reduce their prolonged chasing ability. We identified the riders who had fallen into the trap, and asked each to reflect on their own performance and describe what had happened. We are pleased to say they recognised the errors and relayed it back to the group correctly. After another hard effort, we needed some down time. Another skills session, weaving in and out of a line of riders was the exercise aimed at improving confidence, communication and focus. By rider request, we then moved into some simple lead-out train efforts, that saw a fast improvement in organisation as the session progressed. Each lead-out delivered the same sprinting rider, who all buried themselves and gave convincing race like efforts. Just when they thought the session was ending, we introduced the customary end of session race. 5 laps with energy depleted sprinters was meant to level the field, but again the performance was high. The race ended a very successful session. We thank London Dynamo greatly for organising enough riders to make these sessions a huge success. We would like to hear from other clubs and organisations that would be interested in attending one of our 3 hour private sessions.